I have found this on the Kenwood site. 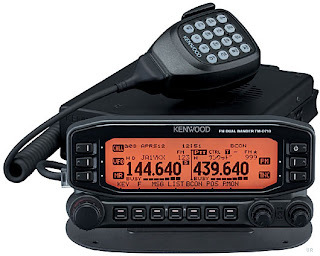 "When the transceiver's EchoLink Sysop mode is ON, it cannot communicate with the MCP-2A"
I just did basically the same thing you did and initially had problems using the Kenwood software. You probably have already done this - check the speed setting of the COM port in Windows. Mine was set too low. I'm not sure what fixed it, but after I disconnected everything and hauled the Kenwood off the shelf and on to the bench and plugged the cable in the back it started communicating. Guess it was in some mode it shouldn't have been. The socket on the back of the main unit is very deeply buried, with a narrow "tunnel" to get the plug into. If the plug you have is a typical "spare" such as supplied by Maplin, its shroud is too big to fit properly into the "tunnel". This may have been your problem. I bought an "Apple Printer" cable which has a mini-DIN plug on each end, cut it in half and put a D9 socket on each cut end, so for a small outlay (vastly less than Kenwood want!) and half an hour's work, I have two cables that work in either position. And as you've found, you don't actually need two cables, you can just shift one between the two positions, providing the plug's shroud isn't too big. That may have been it. It wasn't easy getting the plug in by groping round the back while the rig was on the shelf. After I disconnected everything and took it off I was able to ram it in. The cable I made up myself using one of those discrete plugs. I'm fairly used to soldering to them but I wish I'd known about the Apple Printer cables - it could have saved me a lot of time.